Pearson Education - What's Your Competitive Advantage? 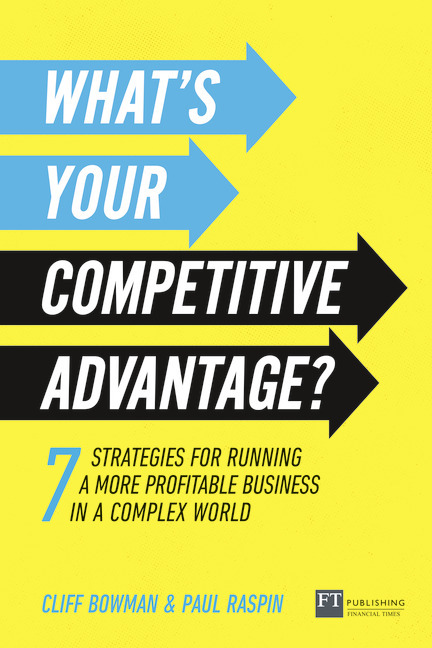 Bookshop > What's Your Competitive Advantage? Buy What's Your Competitive Advantage? "Disruption is a double-edged sword and this book helps firms understand how their competitive strategy, people and change processes can be adapted to disrupt before they are disrupted." “What’s Your Competitive Advantage” offers a way to work with the realities of a complex world and the changing needs of your business. We live in a complex world, no-one can predict the future and we can’t anticipate the ultimate impact of any actions we take. These realities make the task of successfully leading a business incredibly challenging. SPECIALIZATION - choose to focus on a single product or product group and compete through superior product performance. INNOVATION - Competing through product innovations. NO-FRILLS - Serve price sensitive customers with a stripped down alternative product or service. TARGETING - Focus on a specific market segment and serve the needs of these customers more effectively than less targeted rivals. Built on insights from research into economics, strategy, organization theory and complexity science, you’ll discover a practical approach to creating value for your business in turbulent times, with advice on how to enable these plays with the structures, systems and culture of your business. Cliff Bowman is Professor of Strategic Management at Cranfield School of Management, UK. He previously held the post of Dean of the School of Management and Director of Graduate Programmes, and is a past Chairman of the European Case Clearing House. Cliff has also been a non-executive director for Institute of Physics Publishing Ltd. Bowman’s ‘Strategy Clock’ which emerged from his PhD is a widely use tool for analysing the competitive positioning of products. Paul Raspin completed a PhD in Strategy Management at Cranfield School of Management in 2004. He established Stratevolve, a strategy consultancy in 2001, which works with executives and senior management teams to develop effective business strategies, resolve complex business issues, and develop strategic investment options. Paul is also a visiting senior fellow at Cass Business School where he delivers strategy and finance courses to Executive MBA students.